Peter Ilich Tchaikovsky was born in Kamsko-Votinsk in 1840 and died in St. Petersburg of cholera in 1893. In between he composed some of the world’s loveliest, most romantic music, married unhappily, suffered terrible bouts of depression that were linked to both his genius and his homosexuality (which he hid and referred to in his writings only by means of a hieroglyphic), and was acclaimed at home and abroad. Although such authentic genius defies rational interpretation, except, perhaps, by another genius, Ken Russell’s “The Music Lovers” sets out to do just that. At least, I assume that’s what the film set out to do. Because “The Music Lovers” plays rather loosely with some of the facts of Tchaikovsky’s life, it can be accepted only as the kind of interpretation that certifies the most baroque speculation. Never, perhaps, has one movie contained so many smashed champagne glasses, so many lyrical fantasies (with so many white swans), so many sordid confrontations, so many clothes torn off in twisted passion, so many references to the joys and terrors of artistic creation, even so much music—but all to such little ultimate effect. 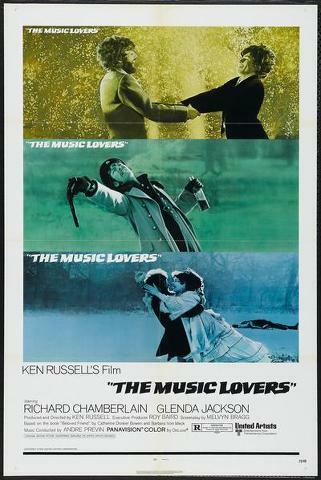 Mr. Russell’s “Women in Love” was a fairly gaudy movie, but if you put it alongside “The Music Lovers,” it would seem, I suspect, as austere as an Army training film. Unfortunately, Mr. Russell’s romanticism, though quite brave in its headlong intensity, and in its sincere attempts to find cinematic equivalents to mysteries for which there are no equivalents, is of a far lesser order than Tchaikovsky’s. Melvyn Bragg’s screenplay more or less takes off from “Beloved Friend,” a collection (edited by Catherine Drinker Bowen and Barbara Von Meck) of letters that passed between Tchaikovsky and Nadejda Von Meck, the wealthy patron he never met but who, in one of the sillier sequences in “The Music Lovers,” spends some ecstatic hours lying beside his sleeping form. Even though Mme. Von Meck was probably the most important woman in Tchaikovsky’s adult life, the film allots much more time (almost, in fact, as much as it allots to Tchaikovsky) to Nina, the neurotic, sluttish girl he married, lived with for several weeks and then left. Even if Tchaikovsky effectively put Nina out of his mind, the movie doesn’t. However, Mr. Russell’s speculations are not as offensive as his frontal — and often absurd—attacks on the emotions. Richard Chamberlain, who had to go to England to prove himself an actor, is fine as Tchaikovsky, looking a bit like a haunted faun, and Glenda Jackson is all sinewy nerves as Nina, but they are hard put to match the (what seems in retrospect, anyway) nonstop hysteria of the production that surrounds them. When Tchaikovsky sits down to play a public performance of his Piano Concerto in B flat minor at the Moscow Conservatory (which he never did), the concerto becomes a repository of such fulsome flashbacks (suggesting an incestuous relationship with his sister) that it’s impossible to hear the music, and to respond to it, without focusing your eyes slightly off-screen, as you might do when you’re seasick and don’t want to throw up. If the actors are not moving, the camera is, and sometimes everything is moving, as in an extraordinary honeymoon scene on the train that is taking Tchaikovsky and Nina back to Moscow, Nina, drunk and naked, rolls around on the floor of their compartment as her husband studies her in terror—while the camera studies both of them from a vantage point on the ceiling that is probably occupied by a ventilator. It’s just a little too spectacular, and too undulant. The effects eventually cancel themselves out. The music, played by the London Symphony Orchestra conducted by André Previn, is decent enough, that is, when you can hear it in spite of all the scenic cutaways (which are only a little more interesting than the fjords favored by Andrew Stone in “The Song of Norway”). I expect many people may look on “The Music Lovers” as an advance on the classical musical biographies turned out by Hollywood in the 1940’s, but for all of its so-called frankness, there isn’t much difference between this kind of sensational, souped-up popularization and the sort of pious, souped-down popularization that cast Cornel Wilde as Chopin and Robert Walker as Brahms. By the time “The Music Lovers” and Tchaikovsky end, Mr. Russell has told us a lot less about Tchaikovsky and his music than he has about himself as a filmmaker. Although Tchaikovsky died of cholera, for which a hot bath was prescribed, the implication of “The Music Lovers” is that he was simply boiled to death, which is what the movie does to his genius.